Pack Your Passport, Baby: Reasons not to take a baby on a cruise? No way! 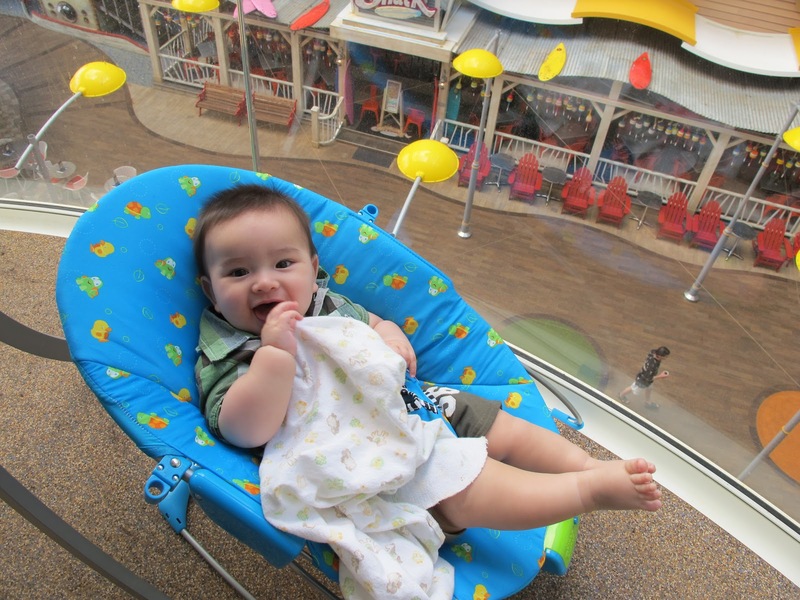 Reasons not to take a baby on a cruise? No way! 1. "Babies don’t sail free. With the exception of a few lines that have standard kids-sail-free deals and occasional promotions, you have to pay the going third-person rate for a baby sharing a cabin with Mom and Dad. That can be a hefty sum for a trip baby is not going to remember. " Well no, they don’t, and I’m curious why the author feels they should. They may not eat much in the dining room, but there are port charges and taxes regardless of age. And as the author mentions later in her article, there are linens to change and high chairs to clean after meals. From diapers to baby gear to school supplies, we all know there are added costs when you have a child. The cost for an additional traveler will be one of those. 2. "You can’t pack light. What with the stroller, the bag of baby food and snacks, the bottles, sippy cups, multiple outfits per day and toys, I could have used a Sherpa to get through the airport with all our gear. Had I brought the car seat, I don’t think I would have been physically able to carry all the bags I needed to bring. For little people, babies don’t travel light. " The more you travel with a baby, the better you get at packing. Luckily more cruise lines now will enable you to pre-order baby food, diapers and other supplies for delivery directly to your cabin for the start of your cruise. They obviously come at a hefty cost, but they can be still less expensive than the cost of overweight baggage with your airline, and can be handy if you simply don’t have the room to pack them. On our cruise on the Oasis, we popped into a store on the way to the port and picked up this handy and inexpensive bouncy chair to bring on board. It was really helpful to have a place to seat B while I had a shower or while we hung out and relaxed on our balcony. 3. "It’s not a vacation for mom and dad. Some of the best parts of cruising are not cooking, cleaning or doing laundry for a week. 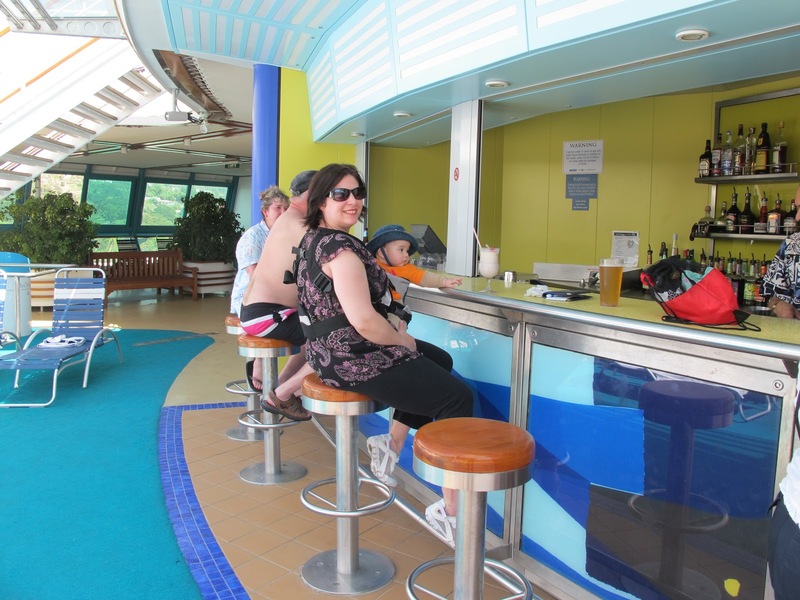 On this cruise, I washed bottles and sippy cups at least once a day, spent a morning in port washing clothes, and brought my own food to the lido buffet for breakfast and lunch. Thank goodness, I didn’t have to wash all the linens we soiled or hose down the high chair after every meal. " This brings me back to point #1. If cruise staff have to wash soiled linens and hose down the high chair after every meal, why would someone expect a baby to travel for free? Washing sippy cups and doing laundry must be done whether you are at home or not. I’d much rather be sippy cups or washing B’s clothes in the sink on a cruise, knowing when I’m done, we get to explore a new destination! 4. "Cruise ships aren’t baby-proof. My active kid wanted to explore everything. Unfortunately, open railings on the pool deck, decorative pebbles in the planters and high-traffic stairways don’t make for the safest play places for babies lacking self-preservation instincts. Unless your ship has a play area baby can access, there is really nowhere on a ship that’s a good place for baby to play. The cabin is your best bet. " 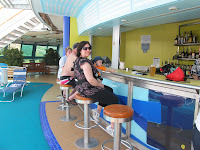 There are MANY safe places to play on a cruise ship. Babies don’t have to have a playground to have fun and most cruise ships have play rooms. I always carry an assortment of age-appropriate travel toys. On foul-weather sea days, we found a comfy corner in a lounge and enjoy some play time. And who would let a baby play on the stairs? At cruise ship stops, we often head first for the nearest playground. We may not get to see all the sights in port, but we DO get to meet local kids and fellow parents and our son gets to burn off energy. 5. "Cribs make cabins even smaller. Thought your cabin was snug? Try sticking a full-size pack-and-play in the middle of it. Oh, and you have to squeeze the stroller in whatever free corner is left. (Tip: Leave the full-size jogging stroller at home.) It makes co-sleeping look really appealing. " Ok, I'll agree with her on one point... leave your full-size jogging stroller at home. We always cruise with a compact umbrella stroller, and store it in the closet or under the bed. Sure, most cabins get pretty cramped with a pack-and-play set up, but thankfully they pack up quickly when not in use (hence the name), leaving you with more room to move about. As B got older, we started co-sleeping, though we often do this when we travel and don't have multi-room accommodations. 6. "No nightlife for you. My kid goes to sleep at 7 p.m., which meant from that point on, someone had to be in the cabin with him. With only Grandma and me cruising with baby, one of us got to go out at night and the other person ended up asleep by 9 after sitting in a darkened room for hours. That’s right — with no dividing curtain on Rhapsody, we couldn’t risk turning on lights. Some ships have in-cabin baby-sitting (if you’re willing to pay 20 bucks an hour) or a nursery where you can put baby down — if he or she will go to sleep in a communal space and transfer easily back to the crib at midnight. " Oh, boo hoo. Many cruise cabins do not have curtains to divide the room, so we have always made a point of booking on cruise ships that DO have them. But even when I’ve traveled with my son in a room without a curtain, I turn off the lights, and once he’s asleep, I pop in some ear buds and put on a movie on my DVD player. Now that I’m a Mom, there are no shortage of movies I’d like to catch up on. Or I’ve turned on the baby monitor, and gone out to the balcony to catch up on the book I’ve been wanting to read for months. I frankly can’t imagine complaining about having some quiet me-time! 7. "The cruise schedule doesn’t always match baby’s schedule. Embarkation day was a nightmare because my kid needs to nap, in a crib, at 10:45 a.m. sharp. When I showed up, screaming child in hand, on our deck to beg entry into our cabin at 12:30 p.m. (they weren’t officially open until 1), I discovered that our pack-and-play wouldn’t arrive until 4 p.m. There was no napping that day. If your baby isn’t a stroller napper (mine isn’t), embark/debark days and shore excursions may be difficult to manage. And, oh yeah, expect baby’s sleeping and eating patterns and schedules to get messed up during the trip. " 8. "Babies can’t use the pool. With the exception of certain ships with splash zones for the diaper set (like some Royal Caribbean and Disney ships), kids can’t use the pool unless they’re toilet trained. That makes sea days in the Caribbean or Mexico less fun — unless you plan on schlepping and filling an inflatable tub/pool. " I admit, this can be a bit of a drag, but surely you can find alternative things to do on those sea days. Adjust accordingly! 9. "Most cruise cabins don’t have bathtubs. Book Disney or a suite for bathtub access — otherwise baby better like sponge baths or showers. Mine discovered during his first sponge bath in the shower that he could remove the drain cover and reach inside the dark recesses of the drain. That was the end of the sponge bath, and I’m not sure he ever got entirely clean while we were on Rhapsody. Again, consider the inflatable tub/pool. I regretted not bringing one." B loves his bedtime bath, so we bring an inflatable tub. Having a baby changes so many aspects of your life, it would be naive to believe the way you travel won’t change too. But planning, practice and a little creativity will go a long way to making a cruise with a baby or toddler a wonderful experience for everyone. Happy cruising baby!